The state of California recently announced a massive infrastructure spending plan. This is likely to be the start of a national trend as politicians on both sides of the aisle recognize critical infrastructure improvements are needed from coast to coast. Increasingly, geomembranes have helped make infrastructure projects more durable and cost-effective. Geomembranes have been used in a variety of applications for decades, but within the last 20 years they have become important elements to transportation infrastructure projects. Geomembranes have for years been vital elements for things like retention ponds, levees and stormwater management. Today, geomembranes are used for even more applications. Geomembranes can provide a moisture barrier for areas of excessive water, such as clay subsoil, protecting roadways from freezing and softening subsoil damage. These are not especially common applications, however. 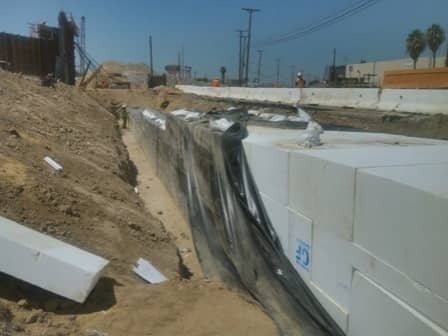 The increasing use of EPS geofoam is bringing new applications for geomembranes to a large number of road construction projects. EPS geofoam is a lightweight, powerful fill material that can inexpensively replace—and outperform—compacted soil. Compacting earth can be very time consuming, as it is usually placed in 6” lifts and often produces less than ideal results. Geofoam is an excellent improvement, but it has a critical weakness. Geofoam is susceptible to damage from fuels (i.e, gasoline, diesel) and chemical exposure. Engineers must account for the potential of leaked fuel and other contaminants, so a protective geomembrane is required to meet department of transportation codes in many states and countries. The EPS geofoam is essentially wrapped like a burrito by the protective geomembrane. Effective geomembranes are strong, flexible, completely impermeable, have very low permeation rates with fuel and protect geofoam from contaminants that can cause damage. For California’s infrastructure plan, it will be critical to choose a geomembrane that meets or exceeds the state’s Department of Transportation requirements. Most states have followed California’s lead (CALTRANS) for setting geomembrane standards on geofoam projects, requiring a heavily reinforced fuel resistant geomembrane like our 9832 XR-5. Geofoam can weigh 50 times less than other fill material, so it can go in quickly and make construction faster, reducing labor costs, allowing for construction in freezing temperatures and keeping adjacent waterways cleaner. 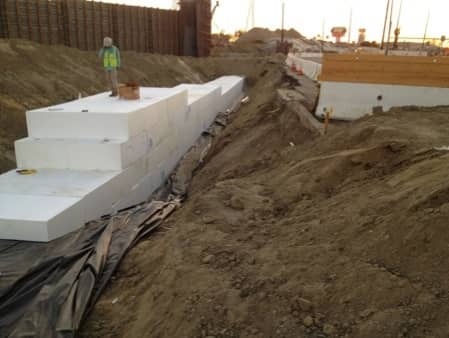 Geofoam is especially effective at reducing lateral pressure, boosting waterproofing and better insulating retaining structures and below-grade walls. In areas that face severe frost that can damage roadways and other pavement, geofoam subgrade insulation provides a protective barrier. To learn more about why global use of geomembranes continues to increase, or to determine the best geomembrane for your application, contact XR Geomembranes.